I recently visited the NARS store on Bleecker street in SoHo with a friend. Naturally I was drawn to the exclusive BLKR collection displayed in the center, took a long time examining every particle of shimmer in the eyeshadow duo and comparing the BLKR single to Lhasa. 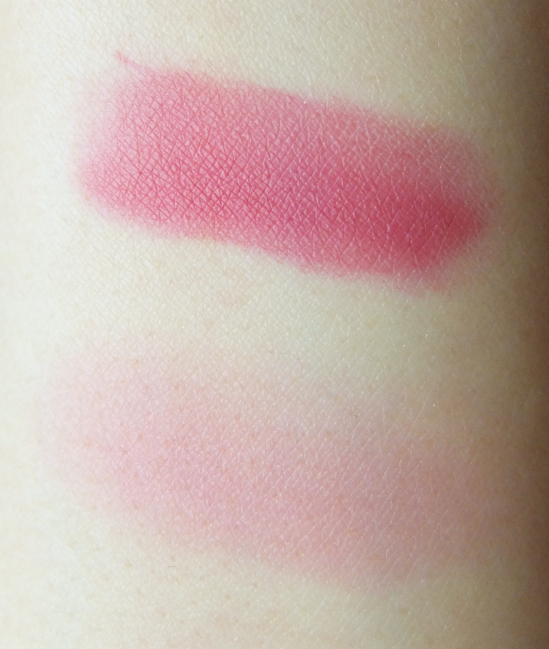 I did not pay much attention to the 413 BLKR blush, however, thinking it was "too bright, too rosy". So I left the store empty handed while my wise friend grabbed a BLKR blush. I managed to kill my lemmings especially for the single eyeshadow because it is close to my beloved Lhasa, which I concluded to be a better and more complex grey color for me (reviewed here). On the other hand, this bright rose blush kept haunting me whispering, "you don't have anything like me, do you?". There is a reason why I was hesitant about the color. Many rosy blushes appear aging and ruddy on me rather than giving a healthy flushed look. I've read that NARS 413 BLKR blush is much pigmented and requires a light hand for application, too. I still wanted to take a chance mainly because of the NARS pressed powder formula that has somewhat dry texture with clear color delivery. If a similar color comes in a buttery soft texture, I wouldn't dare. 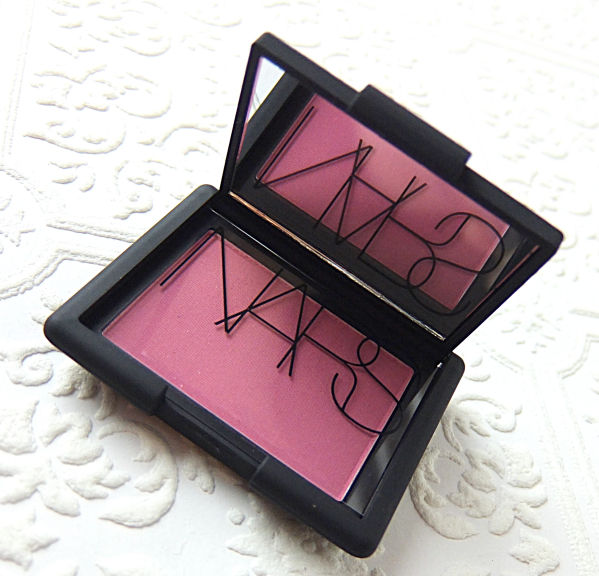 I only have experienced the reformulated version from NARS, but this is my favorite blush formula by far. The pigments are intense and pure, but the application is sheer (if that makes any sense to you), so it is long lasting without losing the initial color clarities. 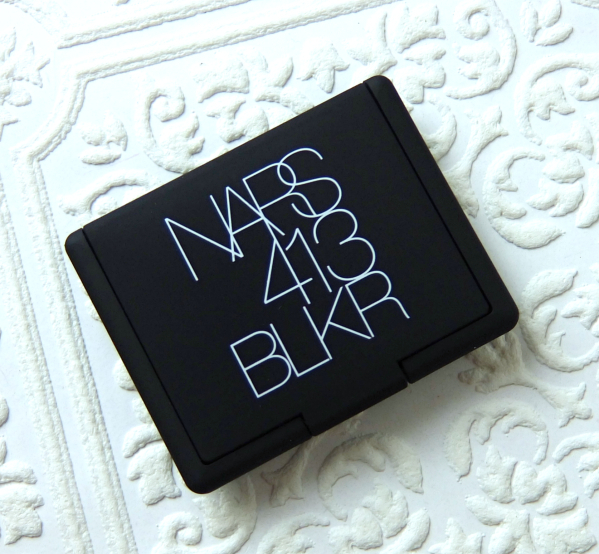 NARS describes 413 BLKR as a "rosebud". The simplicity of all NARS color descriptions is funny because we beauty bloggers always seem to have more words for them. Now I suddenly have an impressive NARS blush collection (6 including 2 recent mini additions), so it is a relief to see at least one easily recognizable NARS blush. 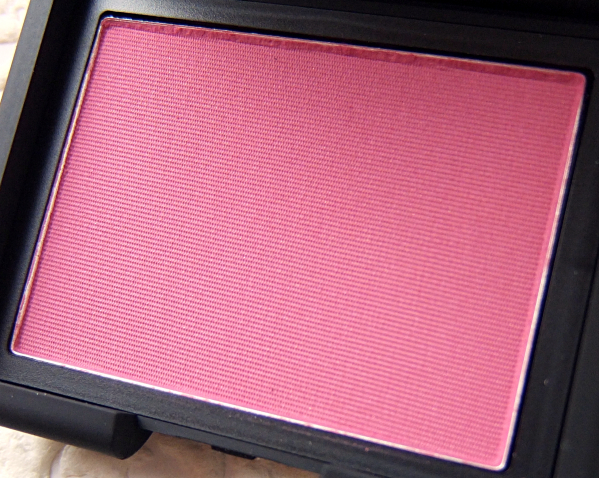 NARS 413 BLKR blush is indeed intense and bright. It is more of an early summer rose rather than a dusty rose, and has some purple and red undertones. The swatch on top is with a couple swipes and the bottom one was made with whatever was left on my finger, which would be closer to the color once blended on the cheeks. Although I have to be a bit more careful with my application and the brush choice, it is surprisingly wearable and flattering on my light complexion. Actually, the color blends in very easily so I don't find putting it on all that challenging. It seems this neutral rose pink with satiny matte finish can easily be worn all year round. 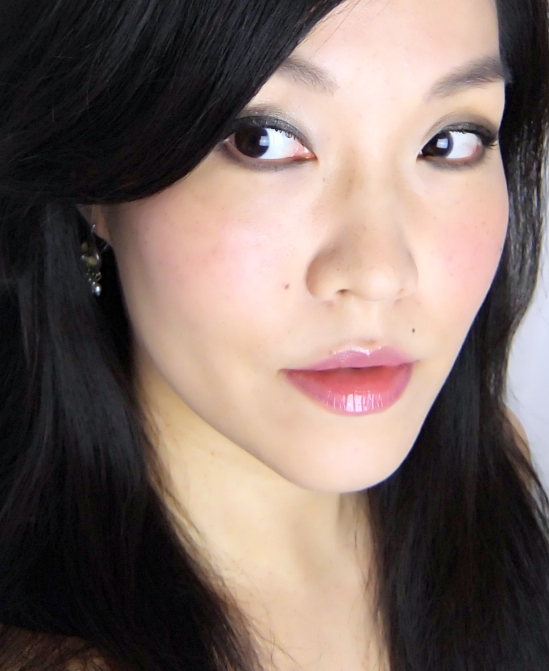 Here is how NARS 413 BLKR blush looks on me. 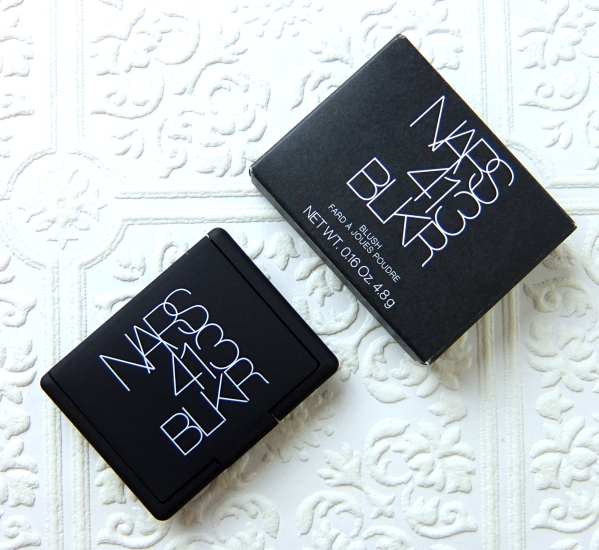 Have you tried NARS 413 BLKR blush or anything from the BLKR collection? I've only recently wandered down to the SoHo/ Greenwich Village shopping area and eyed the NARS store with curiosity - but since I was with family, I didn't want to torture them by browsing make-up :D But I'll definitely pay them a visit at some point; this blush looks lovely on you, Lena! LOVELY SO LOVELY on you Lena!! It reminds me of the MUFE #510 I bought-same rosy shade. I think they're the hardest to find. I mean, there are a lot of them around, but that perfect one that doesn't make you look ruddy is everything! your lip color on the pict is so pretty! I wasn't terribly happy with some of there palettes, either, so I completely understand what you mean! I didn't like their blush before the reformulation, but now I appreciate it more. It is all about personal preference, I guess. looove. this has been somewhat on my radar but i have to admit, its the exclusivity and 'specialness' that is really putting it there and not the color. i need to try it out in person. I've walked past that NARS store several times, but have never managed to go in! I should, though, since I love the look of the 413 BLKR velvet matte lip pencil. The blush is beautiful on you! I agree that those deep berry blushes can be tricky to wear, but you're definitely pulling it off. This shade is sooooo beautiful! I've not really seen more than a shade or two that I'm in love with from NARS but this one is just stunning! I love the matte finish and it really does look beautiful on you, not ruddy at all! I own like 10 rosy shades but I always am willing to try more! It is difficult to find a matte blush that performs well like this, so I'm very happy with my purchase! At first, I wasn't sure what this colour would be like... the naming just threw me of! But look at that swatch! I've always had a hard time with NARS products - despite all the raves (which I think are fully justified!) I never seem to be able to settle on a favourite product (blasphemy I know!) That raspberry colour reminds me so much of "Sin" albeit without the glitter! I think the biggest trick about NARS blushes is that the color we see after applied is often different from the colors we see from the pan. Now I agree it is a "rosebud" on my cheek. I should check out the Amour shade as well. I'm getting more curious about their blushes. OOOH that shade is beautiful! A little different from the usual, too. I want the BLKR Pure Matte lipstick...but I've never pulled the trigger, haha. I really like this colour but I've given up on everything NARS with rubberized packaging.